Just yesterday, Nest announced that it was offering its smart thermostat in 1,000 Home Depot stores, bringing the company's total North American retail reach to 3,000 outlets. The partnership comes after a series of major software upgrades, utility partnerships and an acquisition that mark a noticeable shift for the company. Nest's founders, who came from Apple, worked on developing the first iPod. While a thermostat is a far different product from an iPod, that connection to a consumer technology giant inevitably brings up parallels between Nest's product and other successful mobile devices. And like Apple, the company is notoriously quiet about the upgrades it's working on. In light of Nest's recent news, I spoke with Maxime Veron, head of product marketing, about the company's latest technology developments and how it learns from its customers. Although Vernon wouldn't indicate Nest's next moves, its latest announcements may indicate where the company is headed. Customer engagement and the need to "keep improving"
When it first rolled out in 2011, the thermostat's learning function, which was supposed to adapt to a homeowner's schedule, was criticized by users and reviewers for not working properly. Since that initial launch, the company has upgraded the device from the 1.0 version to a 3.5 version available today. The 3.5 version was the result of a "complete revamp" of the product six months ago. According to Veron, Nest "continues to fine tune even when we don't make an announcement" in order to update the Auto-Away and Auto-Tune functions. The newest version initiates the learning process in three phases (a set point and two user-initiated changes) that have supposedly make the function "much better this time around." The improvements have come through better data collection and analysis, which Nest doesn't comment on in detail. In order to address criticisms of the product, Veron said that Nest looked at every single piece of customer feedback from Amazon and app stores. "We tweak and prioritize based on what customers are telling us," he said. "All the recent upgrade announcements we've made have been based on learning experiences. We were able to gather all of this data, process it and learn from it," said Veron. The "Trojan horse" of thermostats? After a bunch of companies, including Google and Microsoft, failed to get consumers engaged through home energy management platforms, the industry re-evaluated how to reach homeowners. Turns out, a simple thermostat has been a much better way to connect with consumers, thus opening up new opportunities throughout the home. Veron called the learning thermostat a "Trojan horse" for home energy management. According to Nest, the average customer interacts with the thermostat five times a day. "I can't think of any other thermostat that you would touch that often," said Veron. Nest and handful of other companies are using this engagement to establish more active relationships between utilities and customers. Nest has set up new partnerships with Austin Energy, Green Mountain Energy and Southern California Edison to use the thermostat as a residential demand response device. In exchange for turning down a homeowner's thermostat automatically during times of peak demand, utilities will compensate customers. Don't call it demand response, however. "It's a bad name. No customer in their right mind would know what that means," said Veron. Instead, Nest calls it "rush-hour rewards." Working with utilities has always been part of the business plan, said Veron, indicating that Nest has much more up its sleeve than a simple thermostat. Because the company has been forming those relationships since the start, it was able to announce those recent partnerships as a full-blown program, not a field trial or pilot. "This is not a beta release. It's ready to be deployed. The thermostat is no longer just a nice-looking piece of hardware, but a tool to help utilities reach their mandates." With its recent acquisition of MyEnergy to improve its analytics capabilities, Nest will likely continue to enhance those capabilities and roll out new programs. Is it really like an iPod? This is the question that Greentech Media Editor Eric Wesoff posed when Nest first launched its thermostat. His answer was "no." An iPod or iPhone are completely different than a thermostat, which can't "recreate the excitement of an entertainment product," he wrote. Veron somewhat agreed with that sentiment, saying, "The parallel cannot be totally true." However, Veron said that Nest is taking a page out of Apple's technology and marketing guidebook by creating a simple product and focusing aggressively on customer interaction. "One thing that Apple does really well is an extremely high [level of] attention to detail, high-quality materials and the focus on customer experience." And Nest's experience last winter showed that customers may have a deeper emotional connection to the product than previously thought. 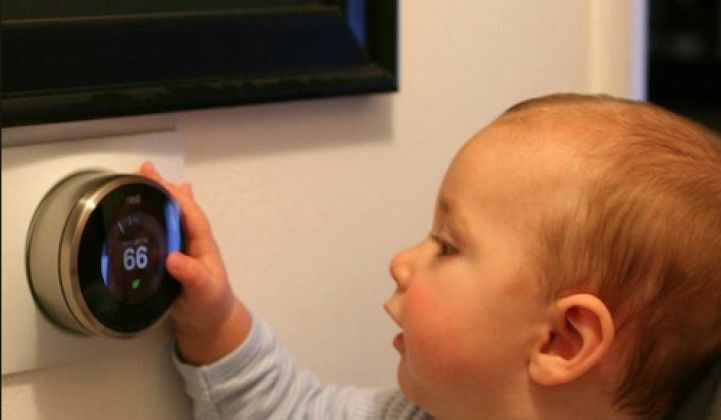 On Christmas day, Nest saw its highest number of installs ever. The company never treated it as a traditional holiday gift when thinking about marketing, but it turned out that people were purchasing it as a Christmas gift and playing with it "like a toy." "I understand it's not an iPod. But we do believe it's something that people increasingly want on their wall," said Veron. With its new retail presence in Home Depot and thousands of other stores, Nest is hoping it can blur the lines between exciting consumer electronics and historically boring devices like thermostats. It may just be working. As for new upcoming features? Nest treats those like Apple does too. "As a rule, we don't talk about future features. But when we look back, it's clear that we're learning a lot about how to make the product better," said Veron.